These are my Lucy Neatby Chequerboard Socks. This is the project I didn't pack away during moving, so that I would have at least some fiber in my hands to help me keep my sanity in the midst of the chaos of boxes everywhere and not being able to find anything. I've enjoyed working on these socks, and they've been interesting because the short row garter stitch toe and heel are new for me. I didn't think I would care for them at first, but they match the thickness of the stranded knitting for the chequerboard body of the socks, and so work quite well. But I've run into a problem. Not because of the pattern, but because of my foot. The checks are stretched so tight before and after the heel, so as to pull them all out of shape. I'm not happy with how this looks and am not sure what to do about it. 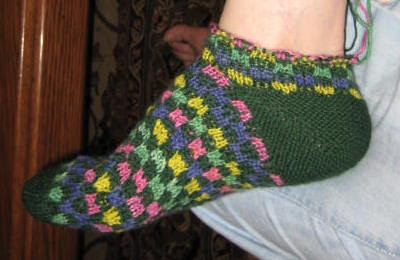 The pattern calls for sizing the sock based on the ankle measurement. I admit I didn't do this because I have skinny ankles. I used the ball of my foot instead, and as you can see, the sock fits fine there. But the ball of my foot has a much smaller circumference than before and after my heel, hence the pulling. What to do! The only thing I can think of is to somehow increase checks, but am not sure how to do that without distorting the checkerboard pattern. The logical place is at the bottom of the socks. Still, I'm stumped! Suggestions??? Hmm, well, frogging back and putting some increases in or if it's wearable and just not pretty, finish it and do the second sock with adjustments. If that works out wonderfully you can always do a third sock and keep the first one as a spare! Bummer though it's a beautiful sock either way. I would rip back to just before the heel and M1 a number of stitches in the green spaces between the checks. Work the short row heel (now it will be wider and deeper because of the extra sts so should stretch less). Then you can decrease them back out at the end in the green spaces around the ankle. Cat Bordhi's New Pathways for Socks book recommends this technique. Good luck whatever you decide! No advice....but I feel for you with sock trials! I do really like that pattern, but I can understand why you want the checks to all be square. If you're going to go through the process of knitting socks, you want them to come out great! Good luck! Nice color choices! I wonder how much you'd gain by changing needle size? 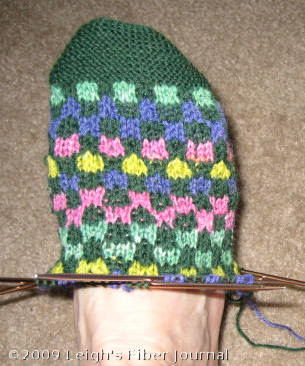 Of course anything like using a different needle, adding in stitches, will make the sock look different to the pattern. If you've knitted toe up socks before, how do they compare to this one in terms of size? could a heel style that has a gusset help? (Charlene Schurch, Sensational Knitted Socks has this type of heel in toe-up) does the stranding of the colours reduce the amount of stretch in the sock? The colors are beautiful, but I understand your annoyance. I am sorry that I have no advice at all. Bur I think it's interresting to start a sock from the toes, I always knit the opposite way. I've always found it much easier to accomodate foot peculiarities with a gusset-type heel. Short-row heels are great sometimes, but if they don't fit exactly right, they pull on the foot. I also concur with those who suggested a larger needle for the tight bits. Going up (or down) a needle size here and there as needed has saved many a sock project for me. I'm useless here. My working theory is: What's inside the shoe doesn't count. This could account for some of my issues with "fit..."
I do love those socks, though. I think you will probably be happier with them if you find a way to add the increase. The commenter who suggested going directly to the pattern author is on the right track, I'd say. I'm curious how the double thickness of yarn in a pattern like that actually feels in a shoe. I'm not sure I would be able to wear them as socks though they would be adorable as slippers - just put a non-skid something on the bottom. They are looking pretty good! How is the house coming along? I have this problem also with short row heels, so much so that I simply won't make them. Since you are doing the heel in a solid color, it doesn't matter when you knit them. So, try this: rip the sock back to where you started the heel, but instead knit in a length of waste yarn and keep knitting with plans to do an "afterthought" heel. EZ mentions that, and there are other sock designers who have instructions. The difference? After you finish the sock and remove the waste yarn & pick up stitches, knit 6-8 rows on the afterthought heel before you do any decreasing. This will add depth to the heel and more room across your instep without having to adjust number of stitches, needle size, etc. Just adding those extra rows in the afterthought heel makes a world of difference. Good luck!